This is intended to be helpful for anyone interested in doing something like this themselves, but others may still find it interesting. Where applicable, I will try to include external links to more relevant information. 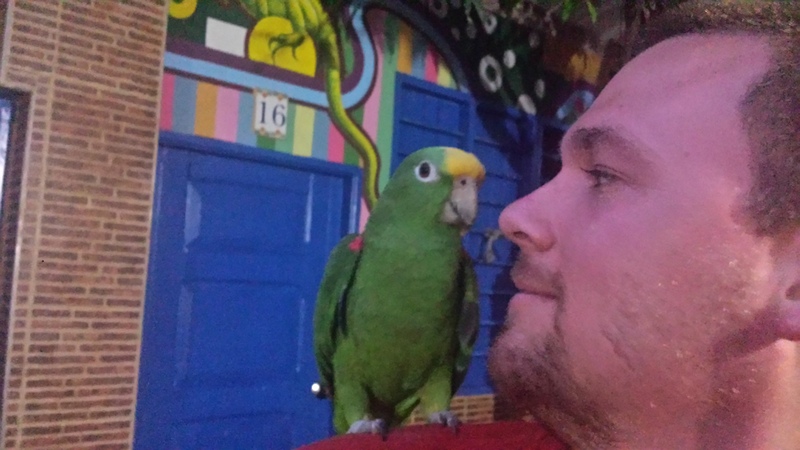 Here are some quick descriptions of the places we camped in South America up to Brazil itself. Notes: Probably the worst campsite of the entire trip. We wanted to make it to Pasto, Colombia, where we had read about people finding nice roadside camping spots. Instead, we broke down and later sat for hours in road construction. We decided to cut our losses and park on the side of the road in the mountains. It was a noisy, stressful night and we left before the sun came up the next day. Could have been worse, though. Notes: We originally tried to camp in a clearing beside the road a few miles from the gas station in one direction and the Peru-Ecuador border in the other. Long story short, vigilantes came and moved us (Seriously. 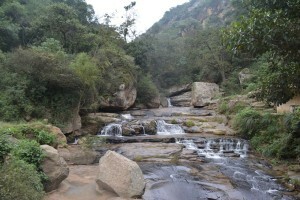 The article is here: http://www.brazildrive.com/2014/07/travel-log-days-23-26-crashes-and-vigilantes/). 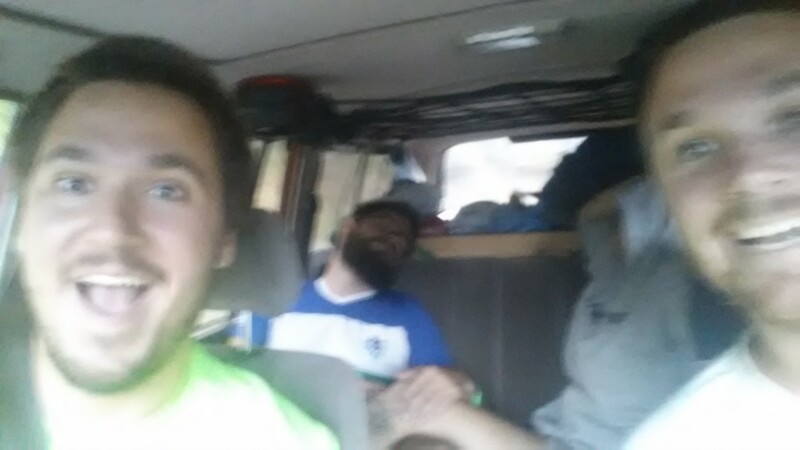 We followed them to a 24 hour gas station where we parked beside a bus driver who was also sleeping in his vehicle and got a few hours of sleep before moving on the next morning. If you ask the gas station attendants, they will usually let you park for the night, no problem. Probably one of the scarier experiences of the trip, but the spot ended up being fine. 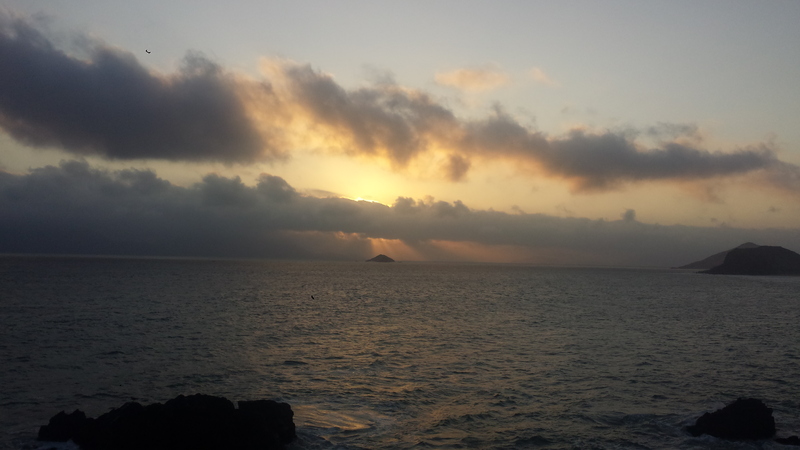 Notes: Just past the town of Chimbote, the small village of Vesique is accessible via a tunnel along the coast. The previous route was clearly a ledge-like road around the edge of the cliff rather than through the tunnel, but half of it was washed out and impassable. We pulled up on this side road and camped near the edge of the cliff. Very cool spot, with great views of the sunset. A little close to the edge and windy, though. Notes: Take the side road next to the left of the Taypikala Hotel in town and head towards the lake. We drove out onto a narrow peninsula and made camp just above a marshy area 10 feet from the water. If you look at our coordinates, Google Maps actually show us as in the water. Very cool spot and felt very safe. The nearby hotel had a security guard but he didn’t seem to mind us. It got very cold though. Elevation: 12,500 feet. 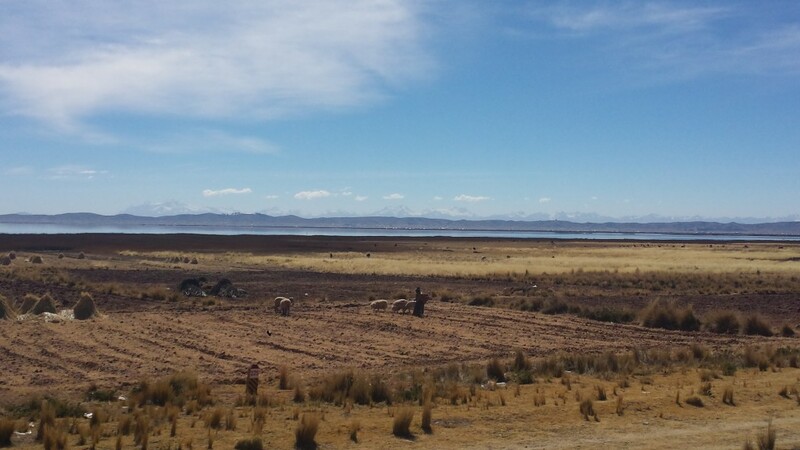 Lake Titicaca, beach camping at 12000 feet! 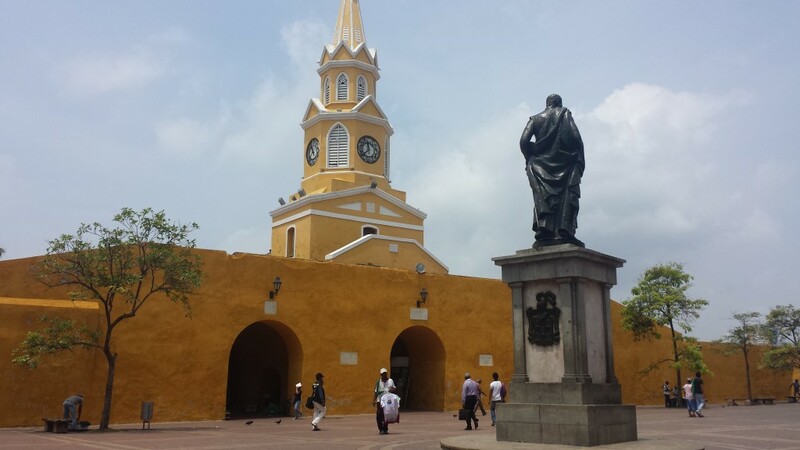 Notes: Driving through Cochabampa (which seemed very nice), we saw a parque north of the town and decided to try to find it. We didn’t make it, but ended up camping just off of a cool, twisty mountain road. It was pretty deserted and felt safe. The city below looked really cool and only one car passed us all night. Elevation: 10,000 feet. Notes: We stayed here while getting our Land Cruiser’s brakes fixed. We found a small, 3-4 room hotel at the listed coordinates. No wifi, but safe and running water. We couldn’t find wifi anywhere in town, actually, but there were a few places to eat and some TVs to watch the World Cup games. Pretty little town, but probably not worth more than a quick stop. Our SPOT gps is probably still sitting in the tree where forgot it in town. 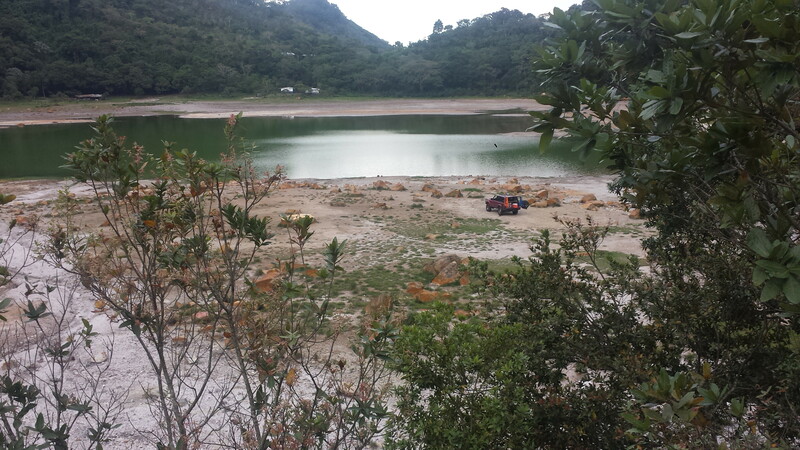 Notes: This was our last campsite, sandwiched by a number of long driving days to make it to Brazil in time. It was under construction, but the attendant inside said we could park for the night as long as we left early. We were awoken late by a group of policia checking out the car, but after we talked to them they left us alone. Safe and uneventful. The last night we would spend in the back of the Land Cruiser. The rest of the trip we spent in comparative luxury, mostly in hotels and hostels around Brazil. Stay tuned for a final logistics article about border crossings and vehicle shipping! 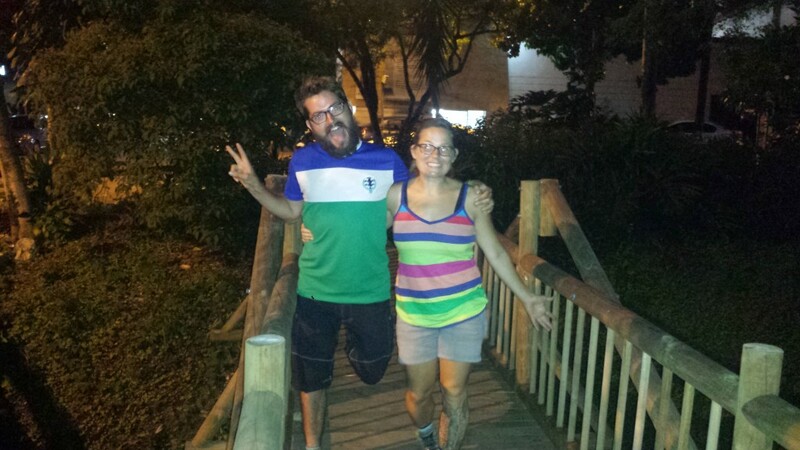 Once we reached Brazil, our trip changed greatly. While we still have a fair bit of driving left, we were no longer camping and crossing unknown borders every few days. We joined up with our mom, who flew down to meet us, and started to stay in hotels and go to World Cup matches. So, I will take some time to revisit the logistics of our trip. This is intended to be helpful for anyone interested in doing something like this themselves, but others may still find it interesting. Where applicable, I will try to include external links to more relevant information. 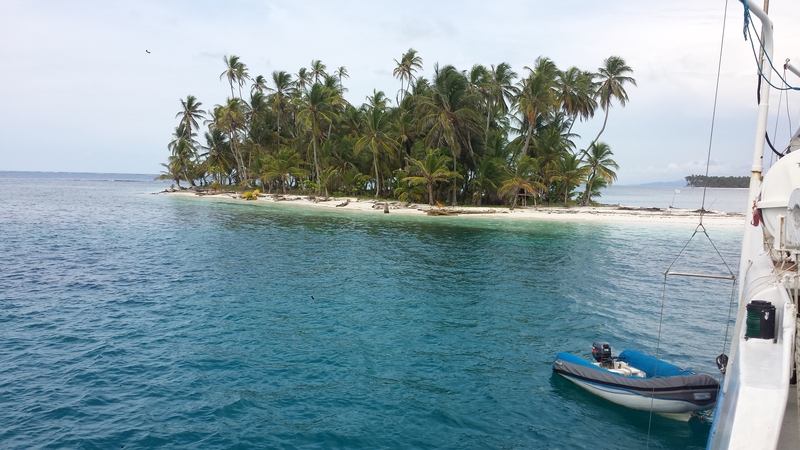 Here are some quick descriptions of the places we camped in North and Central America. Edit: I added some pictures from some of the other articles. Notes: Not much to say here. 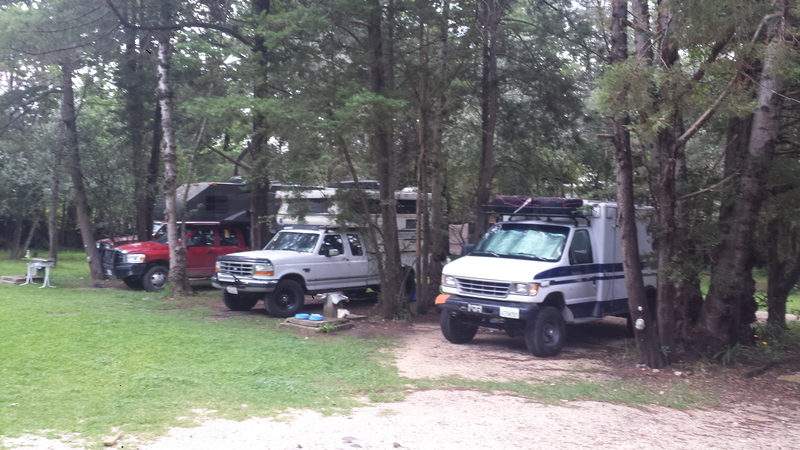 A small state campground in the De Soto National Forest. Free. I pulled in pretty late in the evening, and it was filled with boy scouts. I found a place to park and set up camp. Notes: A hotel in Laredo, Texas near the Mexico Border. 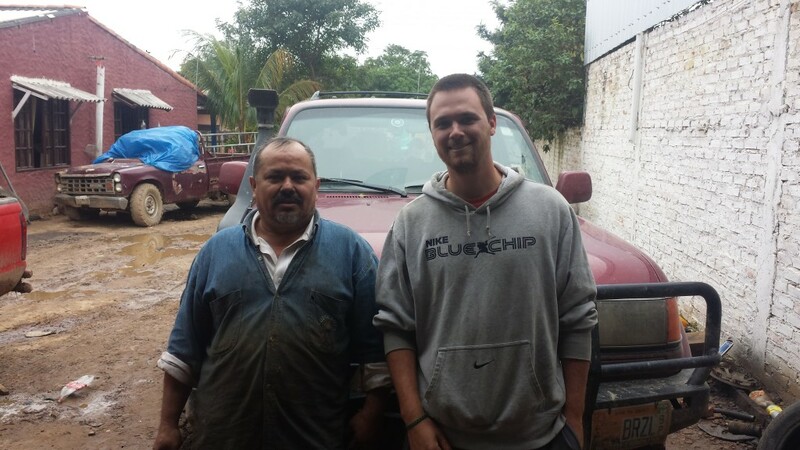 I picked David up from the airport and dealt with a few last minute car problems before we headed for the border the next morning. We were able to fill up with ice and other necessities. Notes: La Maliniche is a large dormant volcano. Outside of town and up a fairly long gravel road. We pulled in after dark and did not get to see much. There was a closed gate at the entrance with a guard house, but we were let in without question when we told him we were camping. There were cabins for rent and lots of amenities, but we drove past and found a small clearing in the woods to make camp. We didn’t realize how high up we were until later, >12,000 ft! Felt very safe and it was surprisingly deserted. Notes: An extinct volcano lake. We had to pay a small fee to enter, a few dollars, but had the entire laguna to ourselves once we did. We arrived early and it’s possible that the gate closes after dark. A dirt road circles the lake, and there were many places to camp and make a fire. We found a flat spot near the water and did a little exploring around the laguna. Very nice. Notes: Tiny town known mostly for surfing. 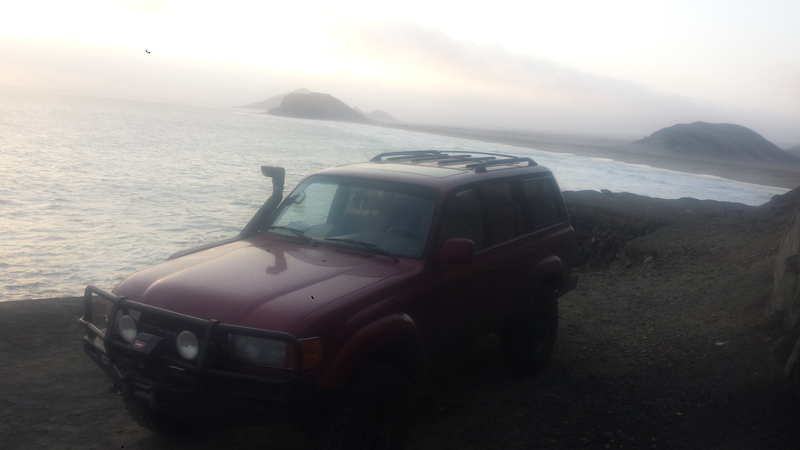 We drove through town and out onto the beach and camped for free. The locals will try to charge you if you park too close to the road. We found a number of small restaurants, hostels, and bars and hung out in one with TV and Wifi. The locals were very nice and even tried to speak English with us. We met a few other (rowdy) Americans, too. Highly recommended. Notes: The Balboa Yacht Club was very important to our journey, although it still managed to somehow not quite live up to expectations. It is well known among overlanders as the place to stay in Panama City and figure out the problems represented by the Darién Gap. (The gap divides Central and South America and cannot be driven across. Instead we had to send the truck over in a shipping container.) Contrary to what we had read, though, the Yacht Club did not seem to be particularly welcoming to overlanders. We ended up parking a few blocks over and spending a lot of time and money on drinks and mediocre food, often times just to be allowed to use the bathrooms. 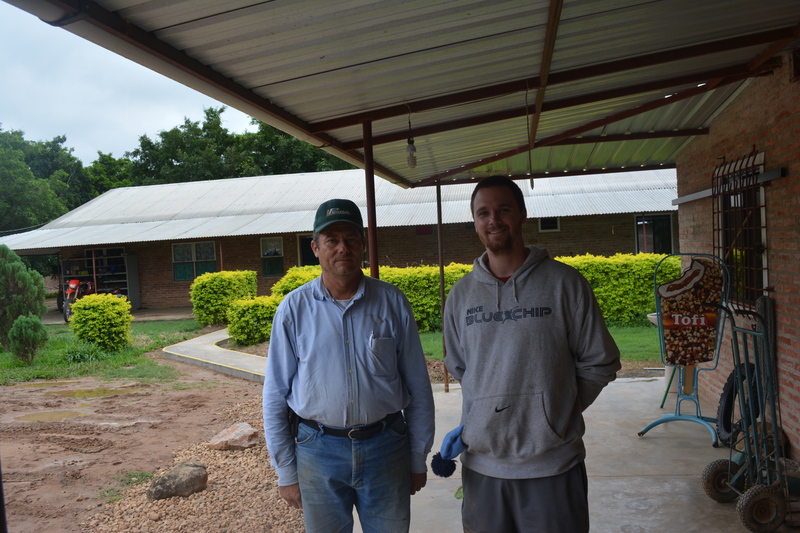 But they did have Wifi, and proved to be an efficient base of operations while we sorted out inspections and paperwork for the Land Cruiser. Part II will be about our campsites once we reached South America. 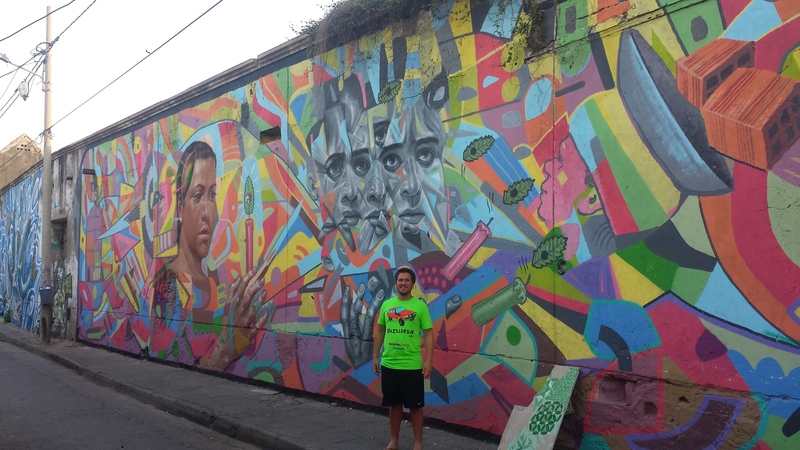 Travel Log: Bolivia and Brazil! We started the last full day of driving before Brazil very early, packing up and hitting the road at 4:00 am. 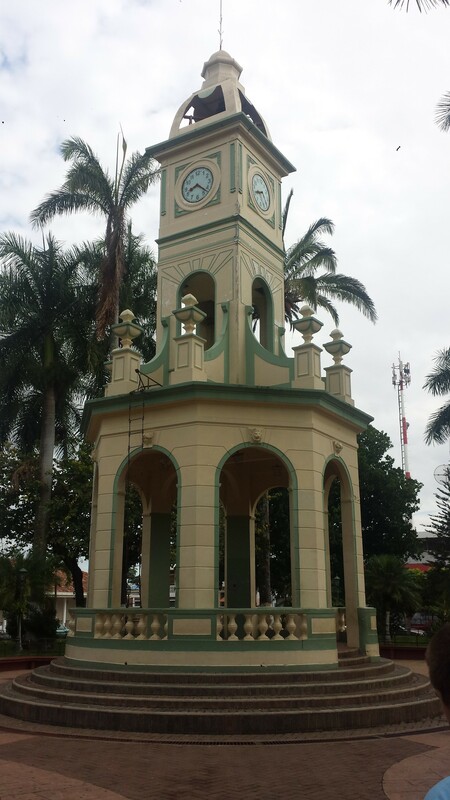 Our goal for the day was to drive from San Ignacio de Velasco, Bolivia to San Matias and the Brazilian border, and then to Cuiabá, Brazil. Originally, this was not our plan. In the months leading up to our drive, we researched and planned out each and every country and border crossing we would travel through. Many awesome websites and blogs chronicle other adventurer’s trips through this part of the world, so most of the time we had at least a general idea of what to expect as we entered a new country. The final leg of our journey, though, was almost entirely uncharted. The common route most take through this part of the Americas is south through Chile and Argentina. The massive Amazon rainforest prevents most east-west travel, and most people want to visit the southern reaches of the continent anyway. We, however, needed to be in Brazil by June 17th, so longer routes were not an option. We had decided on a route that would take us through Cusco, Peru and then north, crossing the Peru-Brazil border at the small town of Iñapari. While very rarely traveled by overlanders, we were able to find some information on the roads and border crossing there. It was very lush and wet, running through the southern tip of the Amazon rainforest. The route would also require us to take a few local ferries, as some of the major rivers it crossed did not have bridges. 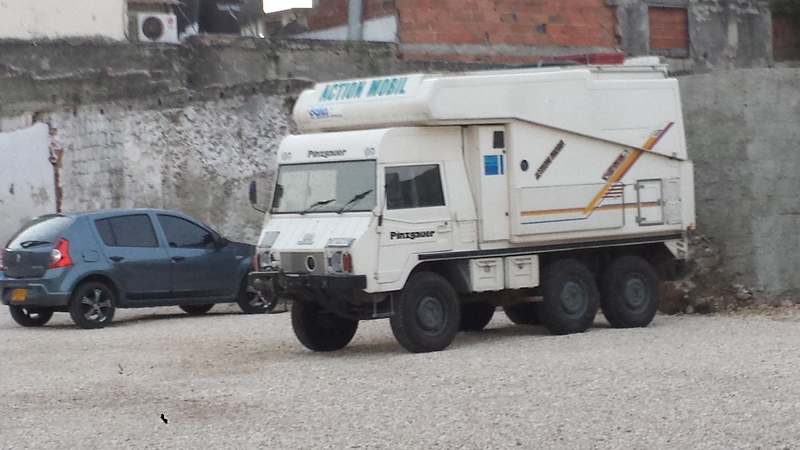 It did, though, prevent us from needing to drive through Bolivia. Each additional country border that we crossed took an additional half a day, on average, and Bolivia in particular requires US citizens to purchase an expensive ($135) visa before entering. As the start date approached, however, we started to have doubts about our chosen route. It was the rainy season in Brazil and there were reports of major flooding in the area. From the Portuguese translations of news articles, we read that many miles of road were covered in 12-15 cm of water and were completely impassible. The ferry schedules were unreliable, if they were running at all. 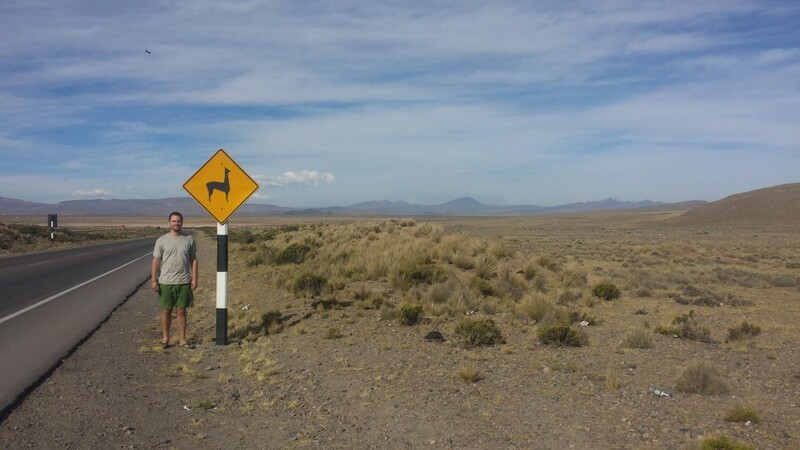 We made the executive decision a few weeks before we left to take the slightly longer route through Bolivia instead. This presented its own set of problems, especially regarding information about the Bolivia-Brazil border. The problem being, there was none. 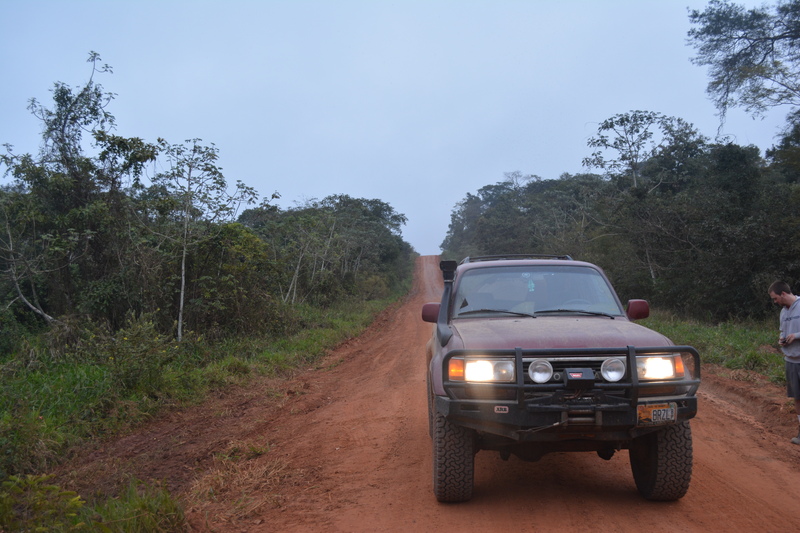 Very few people seemed to drive between Bolivia and Brazil. If they did, they went through Corúmba, Brazil, which was much farther south than we wanted to go. 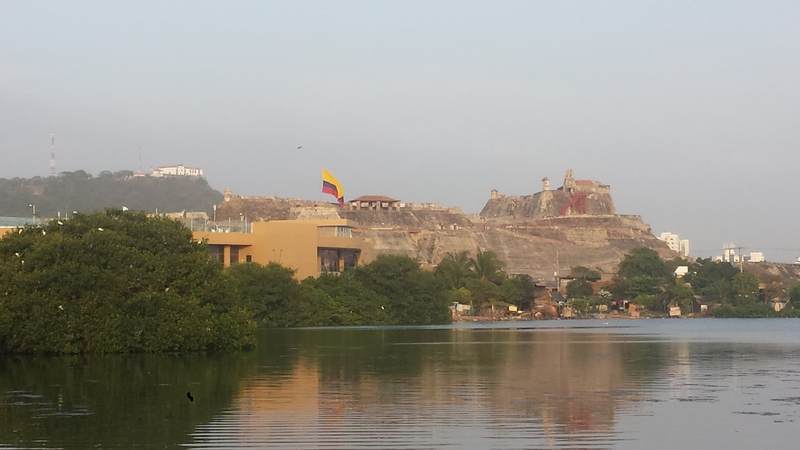 We were unable to find any information, good or bad, about the border crossing at San Matias. Zero. There appeared to be a road to it on Google Maps, though, and it if we could make it we were a mere five hours from our final destination in Cuiabá. We made the decision to go for it. 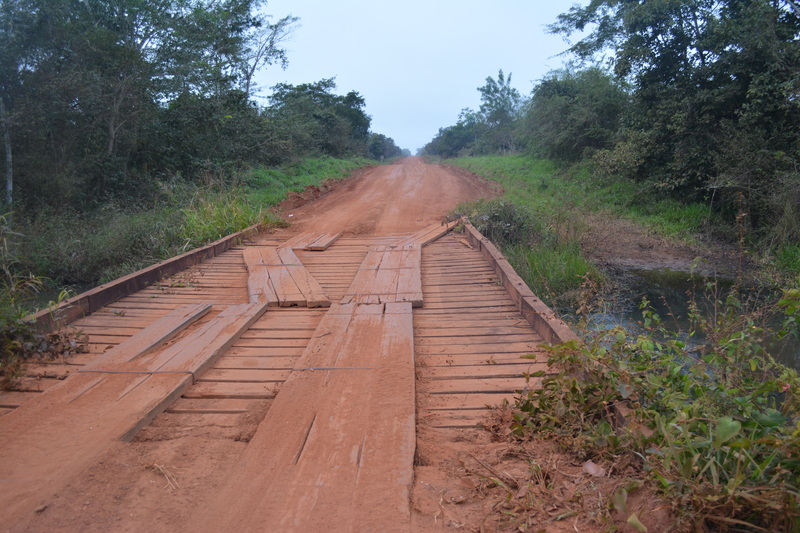 As we left San Ignacio, the already poor roads got even worse. 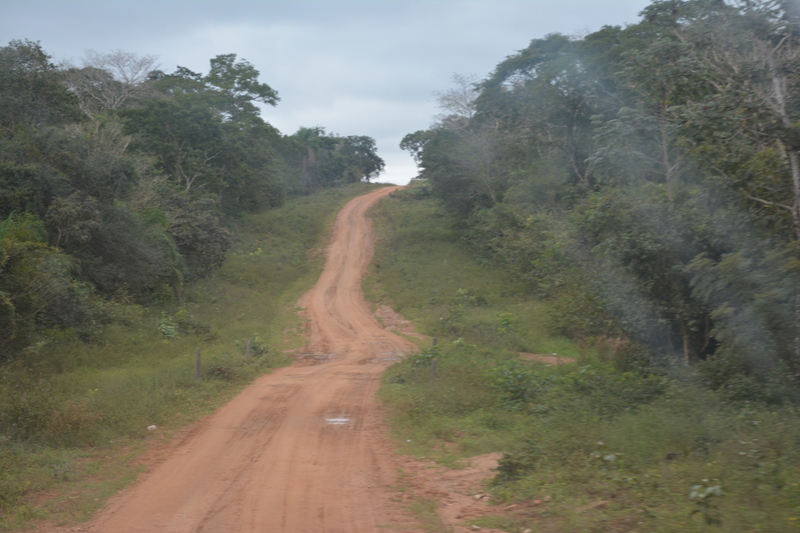 The small, singe track dirt road became mostly wet, orange mud and clay. The beauty of the lush jungle around us was partially lost on us, as we struggled to maintain our speed through the mud and washboards of the road. We regularly stopped to inspect the bridges for safety. Our average speed was roughly 15 mph for most of the day. To make things worse, the last time we had filled up our gas tanks was hundreds of miles back at the Mennonite Colony in Chihuahua. 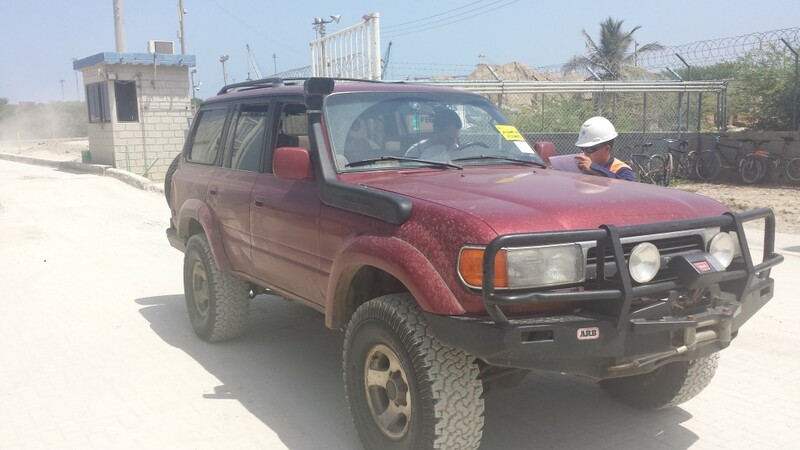 With our spare 20 gallon tanks, we would just barely make it to San Matias. 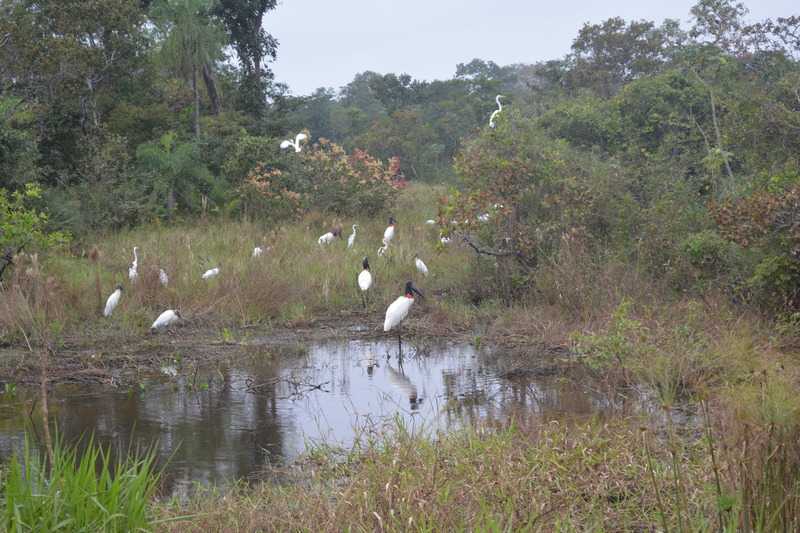 We did spend part of the day driving through the Pantanal wetlands, though, and we saw many birds and animals, as well as a few locals fishing. In total, though, we saw fewer than 20 other people the entire way. Roughly 10 hours later, we finally pulled into San Matias, a tiny collection of single story houses and dirt roads, who’s only real purpose seemed to be protecting the Brazilian border. 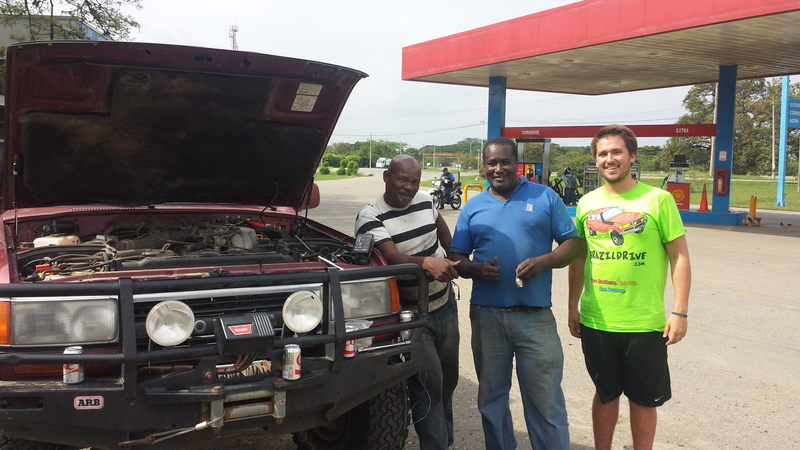 We were nearly out of gas, so after asking some locals, we found the only gas station in town. As we drove in to fill up, we found our way blocked by chains, and an older man came out to yell at us. The pump was broken, he said. Couldn’t we read? We bargained, pleaded, but no: he could not sell us any gas. If we were willing to wait a few days, he might be able to fix it. We continued warily into town to find the customs office. With the help some more locals, we finally found it, nestled into main street of the tiny town and entirely deserted. The woman inside seemed incredibly surprised to see us. I wonder how long it had been since two gringos had walked in asking for passport stamps? She pulled up an archaic computer and started typing. As we waited, we struck up an awkward conversation in broken español about our trip and the World Cup. We told her we needed gas, and asked if by any chance she knew someone who had some. She did! Some 15 minutes later, her cousin pulled up on a motorcycle and produced a 20-liter plastic tank filled with dirty-looking gasoline. We gave it a sniff and decided that dirty gas was better than no gas. 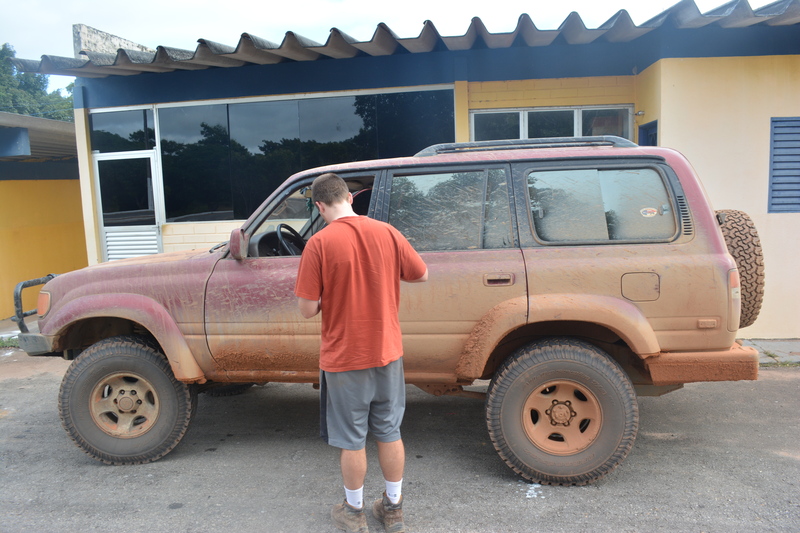 We paid him triple the normal price, got our passport stamps, and drove dirty, weary, and broken to the Brazilian border. 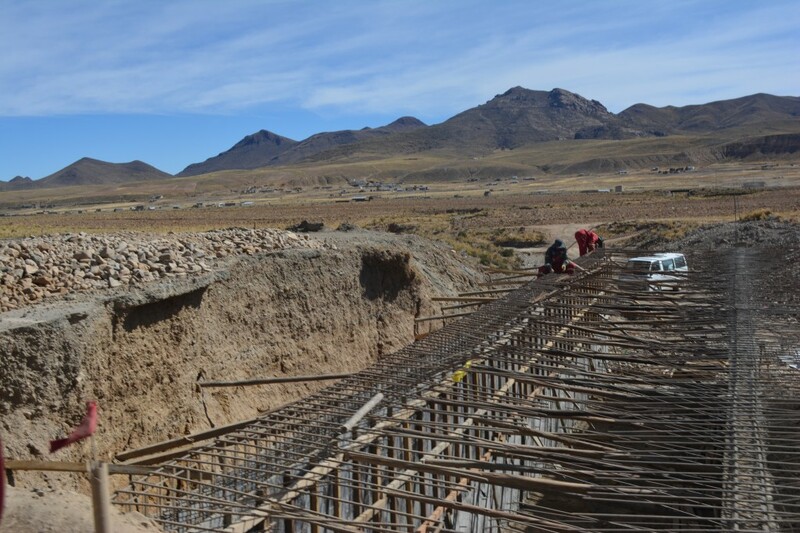 The border itself turned out to be nothing more than a small bridge with Bolivian militarios on one side. 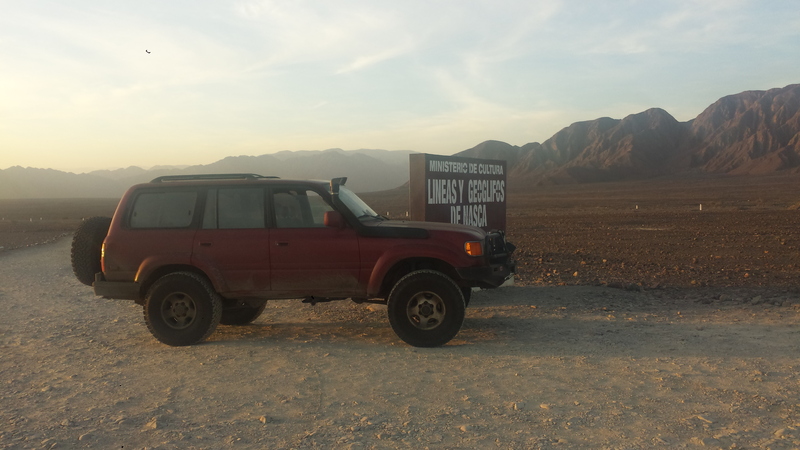 The glared at our mud-crusted ‘Cruiser, checked our stamps, and grudgingly let us through the gate. On the Brazilian side, we immediately saw something that we had not seen in days: pavement! A few hundred meters from the border, we stopped at a small shack where the Brazilian authorities inspected our car and its contents. We were told that our car was OK, but we had to drive two hours to the town of Cáceres to get our passports stamped and legally be allowed into the country. Yikes. On the way, we finally bought gas, and were even able to use a credit card for the first time in days. We finally found the police station in Cáceres, got our papers, and drove the comparatively easy three additional hours to Cuiabá. Our first stop in Brazil – the Police station. At this point, I should probably mention our GPS. Throughout our trip, we had been tracking ourselves in realtime and checking in with loved ones through a satellite GPS. You can see these points at map.brazildrive.com. We rarely had internet, so this was our only way to communicate with the outside world. 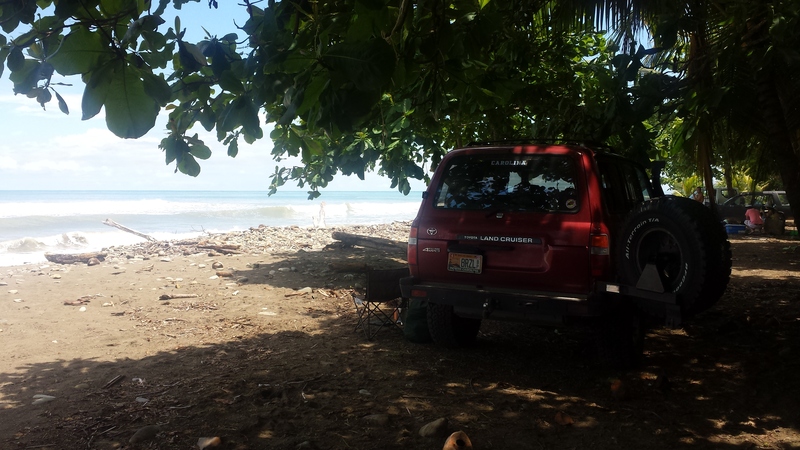 Well, with all the drama of getting our brakes fixed and being car-less, we left it hanging in a tree in Pailón. So, for a few days, no one had any idea if we were ok and our tracking page didn’t move at all. I am told that this caused more than a few people a lot of stress. In particular our mother, who had flown to Cuiabá to meet us and go to the World Cup. Not only were we more than a day and a half behind schedule, but she had not heard ANYTHING from us in four entire days. 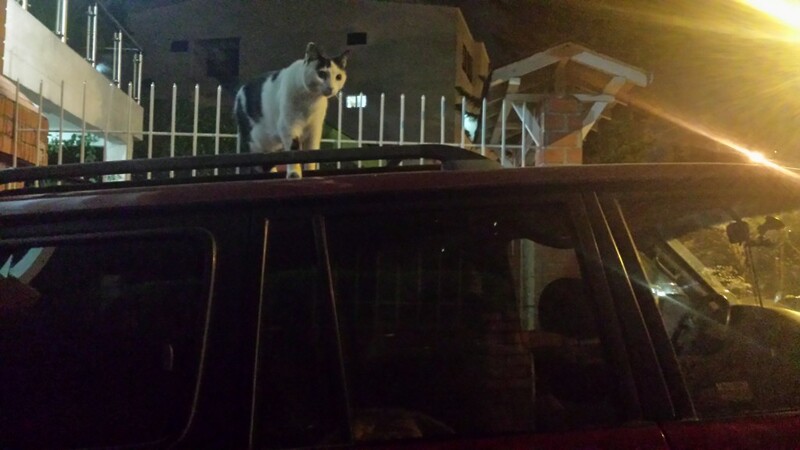 We finally pulled into our hotel in Cuiabá late that evening and honked the horn. Half of the hotel lobby, including our mom, came out to welcome us. She had told everyone about her “crazy” sons, and they had been anxiously waiting for us all day! We got something to eat and started to tell stories about our journey so far, and finally turned in after an exhausting few days of travel. The next day, we had our first World Cup match, Russia vs. South Korea, and more importantly, we had made it to Brazil! 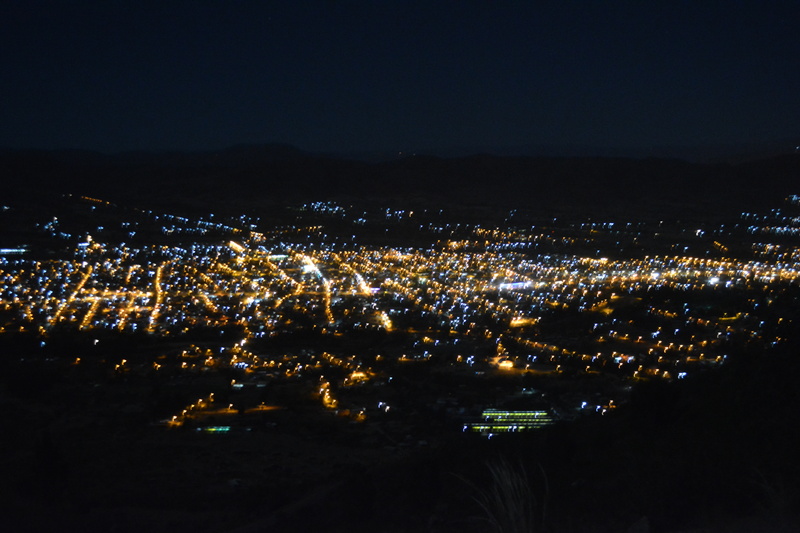 We backtracked down from the mountain above Cochabamba while it was still dark and found ourselves winding even further down from the mountains. The constant snaking of the roads and the apparent lack of pavement made for a rather stressful drive as we were trying to make up time from our border delays the day before. Unfortunately, every slight acceleration was followed quickly by a tap of the brakes, and the constant stop-and-go made for pretty slow time. While the roads were awful, the scenery was nothing short of gorgeous. The huge peaks and mountain plains gave way to lush mountain rainforest and jungle, and despite the slow going, glimpses of waterfalls and rivers made the plodding pace more bearable. Sunrise on the cliffs was also a beautiful distraction from the road quality, even if the blinding sun caused a few of its own slammed brakes. We coasted down from the first section of mountain running dangerously low on gas as we entered the first town. Thankfully we found the gas station and barely squeezed into filling lane. 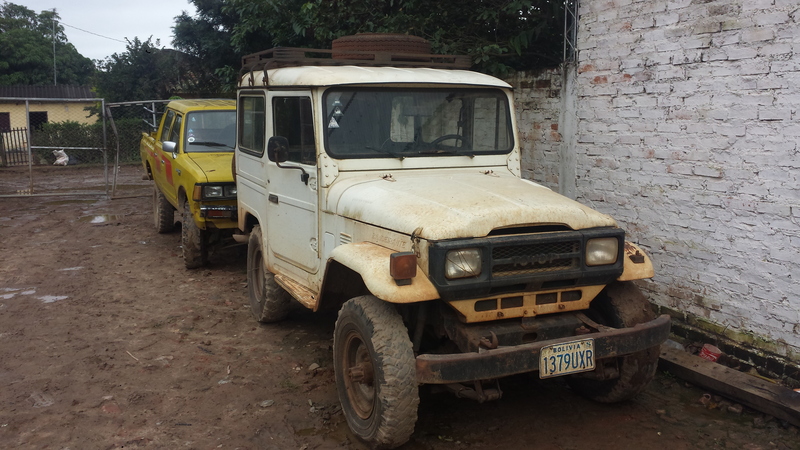 Bolivia was not made for large American trucks, apparently. We did encounter our second example of “foreigner-targeting”, one we would encounter many more times, when we first tried to buy gas in Bolivia. There was a disproportionate amount of attempted police bribery in Bolivia when compared to the other countries in South America. For better or for worse, we had learned to perfect the “dumb gringo” defense. The basics of this are: never admit you did something wrong (you usually didn’t have to pretend), and never admit that you understand Spanish. Confidence is key. One example in particular illustrates this strategy. 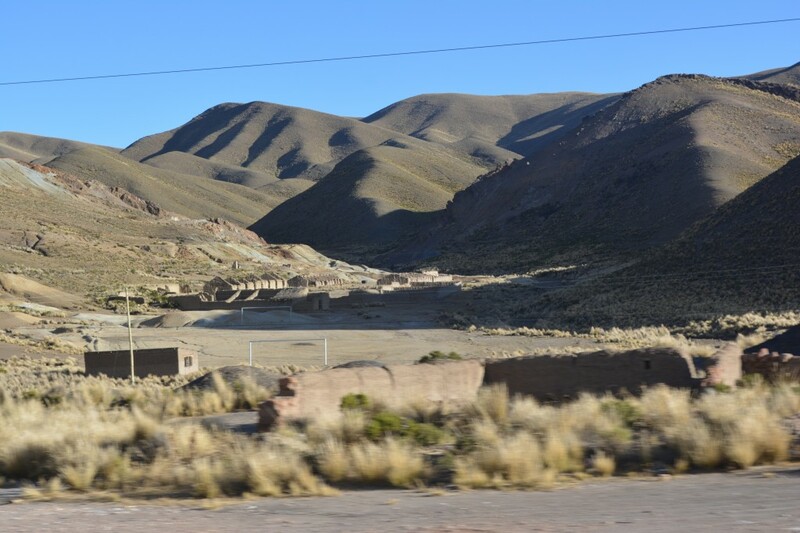 Outside of La Paz we passed through a toll gate and were promptly waved over. An officer walks up behind the car and jotted down something on his notebook, before informing us that we were going 120 kilometers an hour and had to a pay a serious fine. 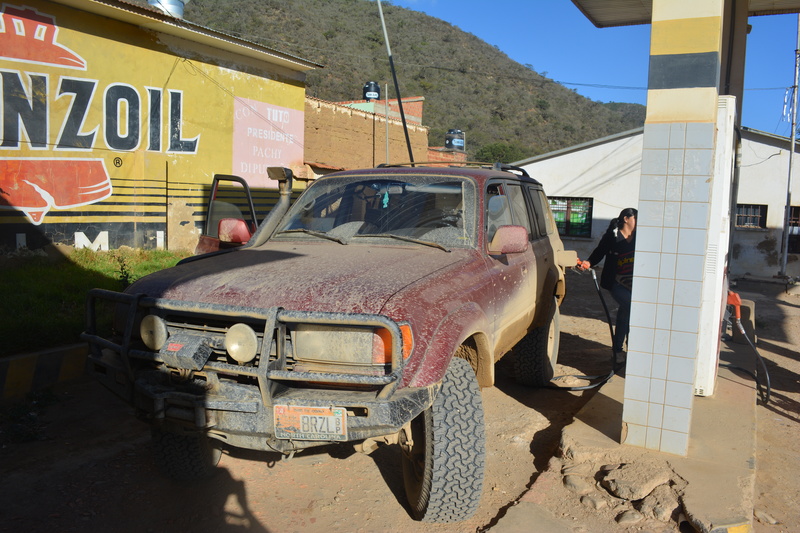 If you read our last post, you would understand that the road quality outside of La Paz is horrific. In truth, I wish we had been going 120 because we would have at least made decent time on the road, but in reality it was physically impossible to go more than 60 thanks to the widespread construction. The officer claimed his “friend” up the road caught us on radar, and showed us our plate number on his notepad – the same plate number he no doubt scribbled down after pulling us over. Business as usual, we had the option of paying the fine back in La Paz, or we could conveniently slip the officer a few hundred Bolivianos to make it all go away. Now we knew full an well what the officer was trying to do, and despite his gruff authoritative attitude, we weren’t having any of it. So we smiled. We handed over our documents, and with a feigned quizzical look on our faces, we asked 120? No es posible! He countered with some long explanation of what we had done wrong (somehow more in depth than “you were speeding”) and how much we had to pay. We explained in poor Spanish that the roads were bad and there was no way we were speeding. He returned each time to his friend and his radar, and we knew we had him. Ok, Grant said pointing to his eyes, let us see the radar. He fumbled and tried to return to the money, telling us it was a huge fine in town and we were better off paying it there. Calmly and without ever losing our smiles, we said we indicated that we would happily pay the ticket but only if he showed us the actual radar first. That was the final stroke, and the officer knew he was defeated. He handed us our papers and said we were free to go, he was only going to give us a warning. Right… the only warning we actually got was to watch out for corrupt cops. We had encountered quite a few already, but this was a grim reminder that Bolivia was full of corruption, and we had better be on our guards. We expected to be targeted by the police, but we were blindsided by how universally accepted it was to target gringos. We pulled up to a pump at a gas station and looked for an attendant to ask about the price, which was not displayed anywhere. The price she told us was very cheap, roughly $1.75 U.S. per gallon. Awesome! It was always nice to find cheap gas when you’re driving 11,000 miles! But then she looked at our license plate… Discovering that it was not from within the country, she informed us that, per the government, the price for foreign nationals was more than double that for locals. We thought she making something up, and refused to agree. She then showed us the computer at the station, and, sure enough, the official price was based on your car’s license plate. She told us, apologetically, that she would get in trouble if she sold gas to us at the local price, as in trouble with the local government! Furious, but needing to fill up very badly, we agreed to buy at the foreigner price and were on our way. To our surprise, this ended up being a nationwide law, and at every gas station from there on out, we paid double the local price to fill up. One station wouldn’t even fill us up at all, and we had to use our spare gas tanks to even buy gas! The first time round it seemed like an opportunistic move to squeeze us tourists for some extra cash, but it was so widespread it was basically institutionalized. You would think most nations want to encourage tourism, but Bolivia seemed perfectly content in exploiting foreigners whenever they could! Bolivian roads, after we finally found actual pavement. We left the gas station irritated but with a new sense of hope. Despite charging extra for gas, the attendant was very nice and after hearing of our travel plans, she told us the road to the Brazilian border was good! We were making a snail’s pace, but at least the roads would be better from here on out! 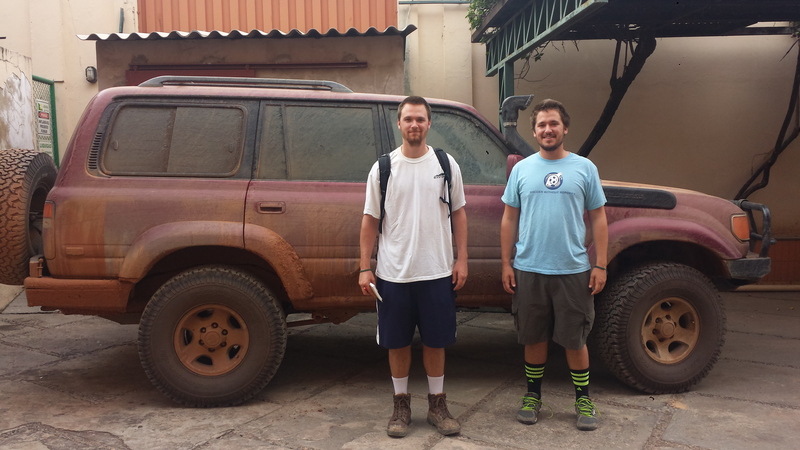 If our first day and half was any indication, if we were going to make it out of Bolivia on time, we would need all the help we could get. Leaving town, the next section of the trip was beautiful. The jungle around us became thicker and greener with every mile and the mountains, although much smaller than before, became more pronounced as their cliffs and edges stuck out among the dense foilage. Waterfalls trickled down in white lines on distant peaks and we made our way past the beautiful backdrops descending further and further in to the countryside. The road slowly began to flatten out and before we knew it the mountains were behind us and the jungle, dense and lush, swallowed up the land around us. It was nice to get away from the switch-back filled roads and get on some straight highway for once, but the mountains had already taken their toll on the Cruiser. The brakes were failing. 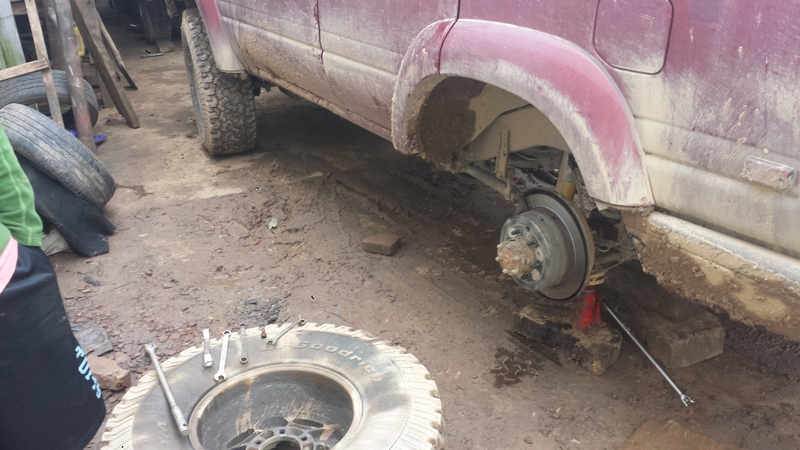 They started making a gravely, scraping noise after our first day in Bolivia. The mountain roads and stop-and-go of the construction had done our brakes in. The fact that they had already traveled several thousand miles prior certainly didn’t help, but Bolivia was the straw that broke our camel’s back. We knew they would need some work, but it wasn’t until we tried to stop and couldn’t, nearly having to drive off the road in the process, that we figured we should stop for help. Easier said than done. The first gas station we stopped at, despite several large signs for a mechanic, said that they didn’t fix cars, and that we would have to go back the way we came. We looked at the brakes ourselves, but they were out of our abilities, so we turned on the hazards and hobbled back down the road. We must have stopped at three or four different places before we finally found our guy. Pirata, they each said, You have to find Pirata. The search for this elusive man led us to Pailon, a tiny town with streets filled with mud after the heavy rain from that afternoon. We were directed to a small house with a large backyard filled with cars and car parts, and that’s where we finally met the man himself. Pirata was short, round man with crooked teeth and a screeching laugh. He could fix the car, but he couldn’t do it that night. He told us to come back the following morning. It was getting dark and we had little other choice, so we left the car with our new mechanic and wandered off in search of the only hotel in town. We checked into a small room towards the back and although we weren’t happy to be sidelined, showers and a real bed were a welcome commodity. Clean for the first time in days, we walked to the town center and found a small restaurant to grab dinner and watch Australia vs. Chile, our first game of the World Cup. 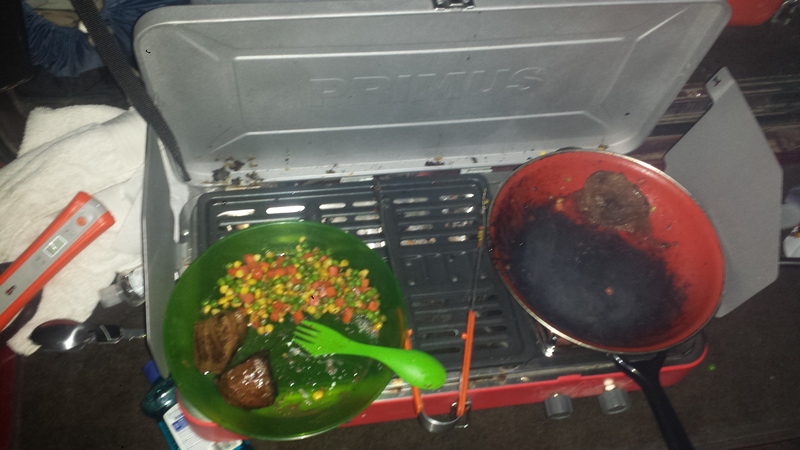 The food was mediocre, but after our ordeals in Bolivia, we were happy to sit down and finally watch some footy. It was still freezing when we woke up and getting out of our sleeping bags that morning was an incredibly difficult task. Fortunately, we were headed to our last border crossing before Brazil, and our heightened spirits made the cold that much more bearable. We grabbed our Clif Bars – the supply running low at this point in the trip – and were well on our way before the sun even came up. We were especially eager to cross the border and get that much closer to the Cup, and were thrilled to see only a few people standing in line at the customs office. We arrived just before six, so we would be right at the front of the line when it opened. Or so we thought. The office, it turns out, did not open until 8:30… almost three hours later. Now we know why the line was so short. We weren’t too thrilled about a three hour wait in the chilly Peruvian morning, so we climbed back in the car, pulled up the hoods of our sweatshirts, and shut our eyes as the sun began to rise on the lake. The nap was a great way to pass the time, but by the time we woke up, the small cluster of people waiting for customs to open had turned in to a long line the snaked well around the side of the building. By then, roughly 100 people were in line to enter Bolivia, and dozens of locals were milling about selling coffee, breakfast, and exchanging Peruvian Nuevo Sol’s for Bolivian Bolivianos. We scrambled out of the car and jumped in line at 8:05. We still had some waiting to do, but people were streaming in and the line was growing steadily longer. Thankfully they opened a bit early and Peru didn’t much care how or why you were leaving their country, so the exit process was a quick stamp and little more. The line quickly moved down the building and we were in and out in under twenty minutes. Not bad. We were through migration by 8:35, but naturally the aduana wasn’t open until 9:30. Despite the presence of two or three officers inside the office, we had to wait even longer while they did god knows what to open the office. We wandered to a small restaurant and sipped on some cafés to kill the time and exchanged our remaining Nuevo Sols for Bolivianos and went back to the customs to badger them to let us through. The large line we had been in the middle of to leave Peru was forming the even larger line to enter Bolivia, and we were already hours behind schedule. 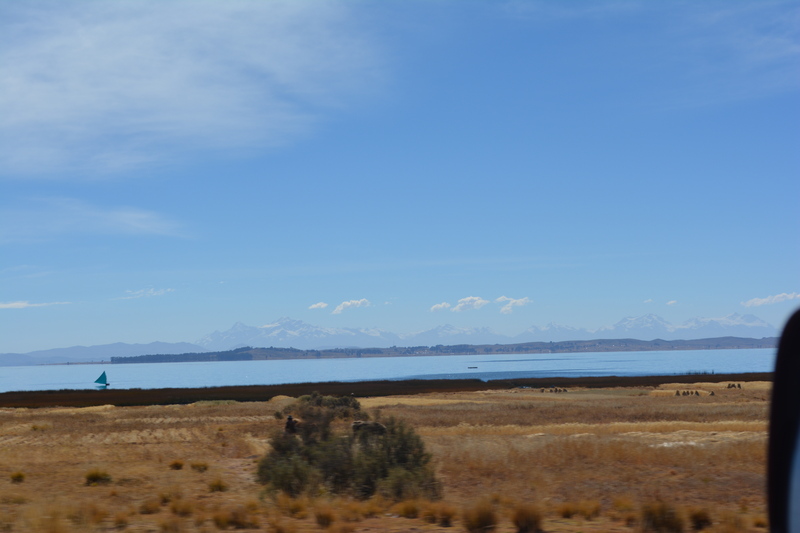 Lake Titicaca, beach camping at 1200 feet! The line to enter Bolivia was not only massive, but horribly disorganized. It snaked back and forth outside before doing the same inside the building itself. We obligingly went to the end and waited. The vast majority of the people in line were clearly either Peruvian or Bolivian nationals. The talked with each other quietly in fast Spanish and waited patiently, clearly used to this type of government inefficiency. The line was dotted with other foreigners, though. There was a German couple, the woman wearing a pink parka, that were clearly having a fight over something the boyfriend/husband had done. We saw what we guessed were a few Eastern European guys, speaking what sounded like Russian, and wearing shorts and t-shirts in the 40 degree morning. It was there in line that we met a couple who were traveling throughout South America playing music and chatted with them for a bit. Aimee was from Argentina and was traveling with her boyfriend John who was from, get this, Durham, NC! He hadn’t lived there in quite some time, but had graduated from UNC in 2005 and knew the area. He commented on the Carolina sticker on the back of the car, and we made small talk until their line wait was over, and we waved as they headed on their way. Excited by the North Carolina connection, we were able to make it through the horrific line and finally get our visas. A few photocopies and an incredibly picky examination of our payment (nothing but crisp, mint condition twenties were accepted) later, and we were finally (legally) in Bolivia. In total, it took us close to 6 hours to get into Bolivia. We rationalized that the wait included a two hour nap, so in all, it wasn’t too bad. But little did we know, Bolivia was just getting started. At least the scenery was nice! The ride from the border was gorgeous. 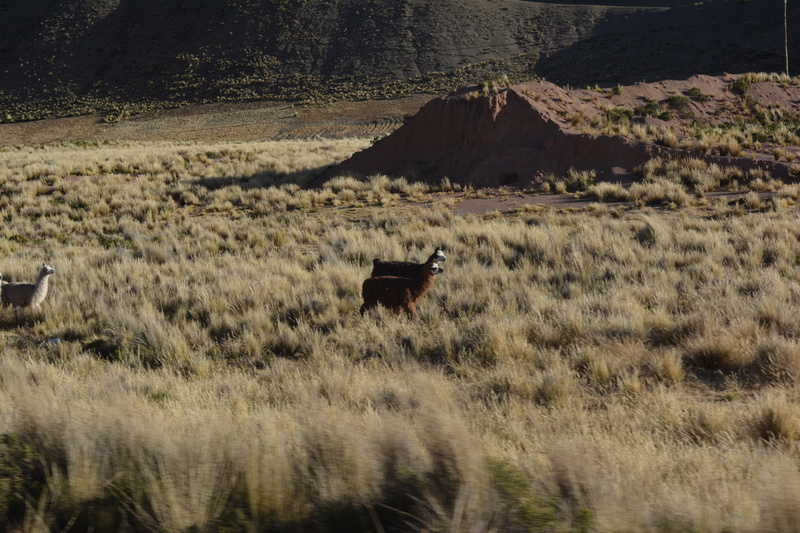 We were still in the mountain plains we had crossed in Peru. 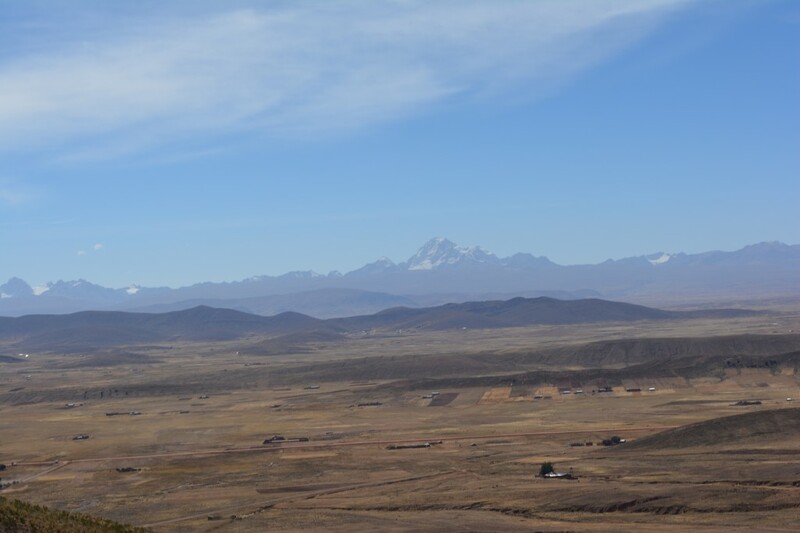 Snow capped peaks lined the distance and small mountain towns and llamas spread across the countryside. As we headed down from the mountains however, the country began to change. We hit La Paz that afternoon, and after failing to find wifi thanks to some horrible construction planning, we gave up and continued east. Slowly. Roads in Bolivia range from “questionable” to “awful”. For every 100 miles of relatively well-kept pavement, there were 75 of mud and gravel. The highways would not have been called such in the States. The border process had taken 4-5 hours longer than we had expected, so we were pushed to make up time. We had planned on making it to Buena Vista, just outside of Santa Cruz, but that wasn’t going to happen. 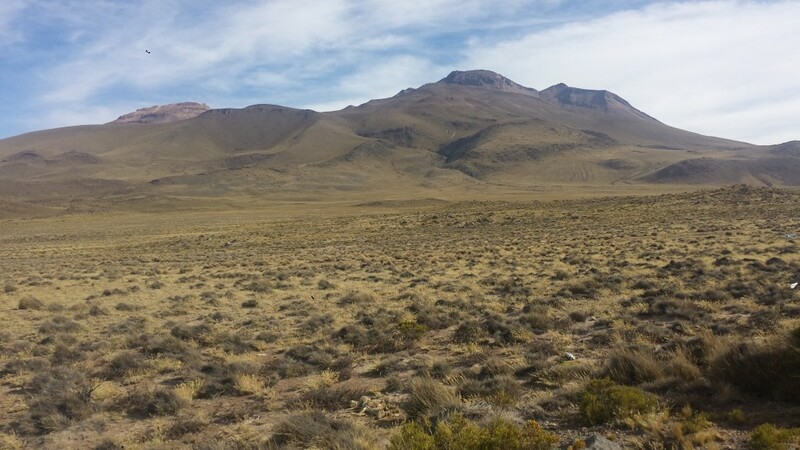 Instead, we identified a national park on our map near Cochabampa, Bolivia, about 5 hours driving time closer to us than Buena Vista, and decided to aim for that. It was slow going to say the least, but we finally made it into town just after dark. Surprisingly, it was one of the nicest towns we had seen on the entire trip! Well maintained roads, minimal construction, and nice shops and restaurants were a nice change of pace from what we had experienced in Bolivia so far. Unfortunately, we had no time to stop and enjoy the city, and as soon as we had entered we were already climbing a hill outside of town to camp for the night. We made it half way to the park on our map before deciding to pull off on the side of the road instead. It had been a long day and we were too tired to go any further. We had peanut butter and jelly tortillas for dinner that night and enjoyed the city lights below. 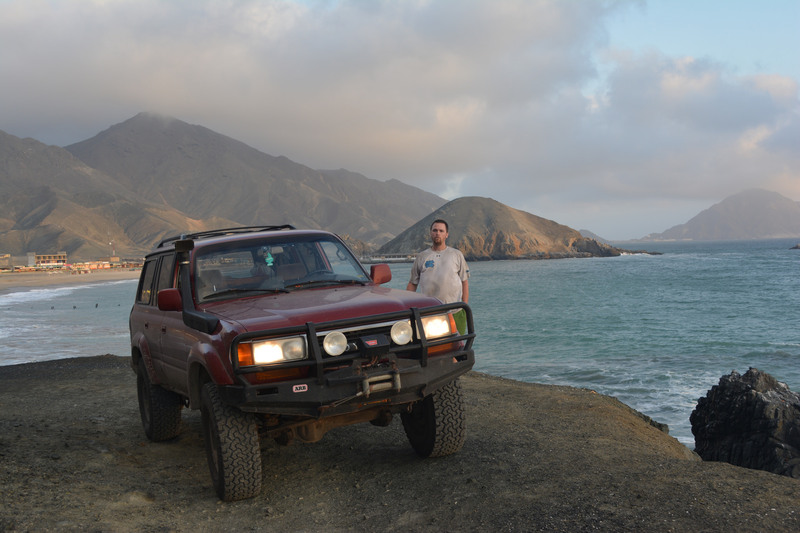 After finally getting the Land Cruiser out of port on Wednesday, we hit the road early Thursday morning for South America. And we had company. Two of our new friends and fellow Americans from the MS Independence, Matt and Emily, were also heading south towards Medellin, and were planning to take a bus. With a little reorganizing, we could easily fit two more people in the car! We had never had passengers, and having someone other than David to talk to was amazing! (Just kidding, David). The first few hours of the drive went by rather uneventfully, and we stopped for lunch at a roadside hut/restaurant, where I ate some kind of fish concoction. After lunch, the drive got a lot more exciting. Two things began to slowly happen. First, it began to get greener. 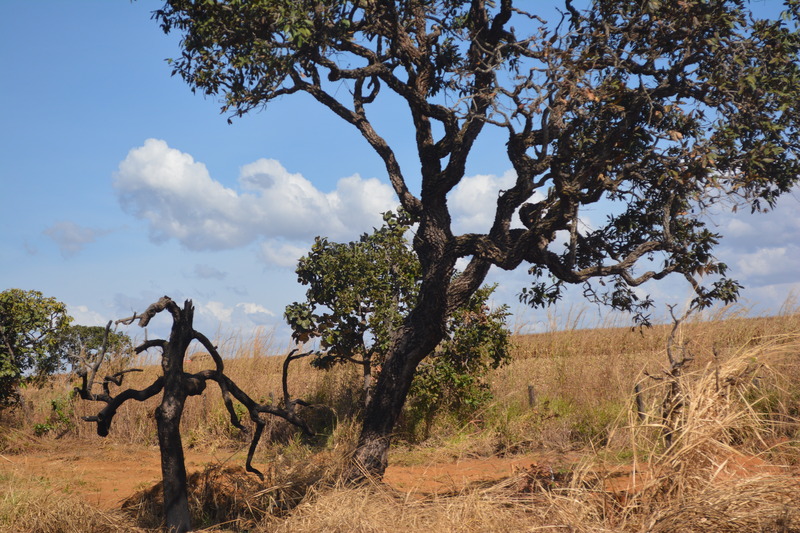 The relatively open landscape of farms and fields began to change to rainforests. Secondly, we started to climb. Our progress began to slow down, but the drive started to be spectacular. Switchback after switchback of mountainous rainforests, lush jungles and the occasional waterfall crashing down beside the road. We climbed as high as 3500 meters (~11,500 feet) in a matter of a few hours, up through and then above the clouds. 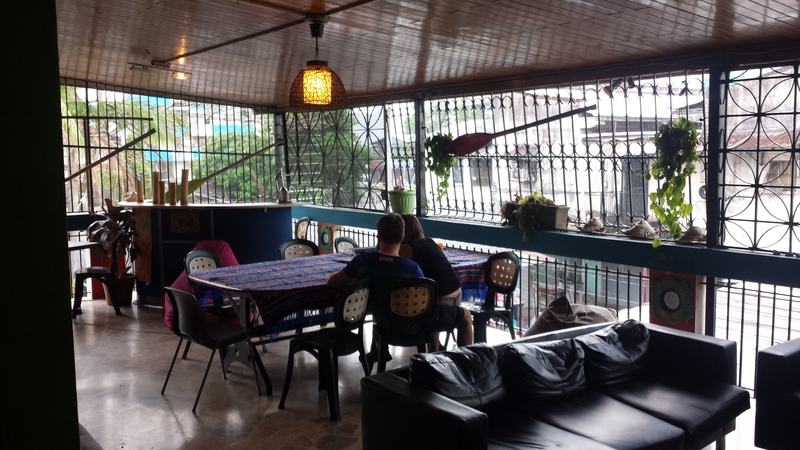 We finally dropped down into the gorgeous town of Medellin, Colombia just as it was getting dark, and pulled into the Black Sheep Hostel, where Matt had made us reservations for the night. We went out to dinner with him and Emily and bought supplies (fresh water, some food, and a soccer ball) at a nearby grocery store before turning in for the night. We left Medellin before sunrise the next morning. 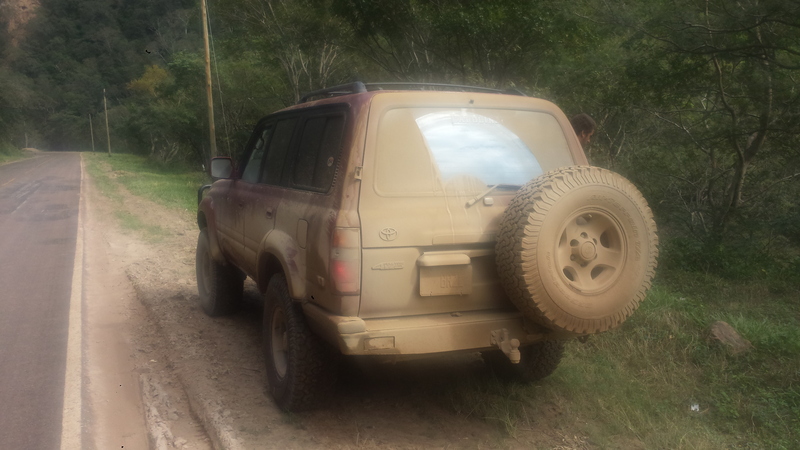 At this point, I probably need to recap some minor problems we had been having with the Land Cruiser so far. When cold, the engine would start up right away and have no problems. When it had been running a while, especially on very hot (95+) days, and turned off, it had trouble starting back again. This had first happened after a very hot 12 hour day through southern Texas, and had happened maybe 5 times since. Each time, letting it sit for 15-20 minutes had fixed the problem. Everything I could see appeared to be in order, so my half guessing diagnosis was the engine fuel pump. As it turned out, I was close. Then we snapped into action. David ran behind to put out the warning triangles, to keep the big rigs from running us over. I grabbed our toolkit from the back, opened the hood and tried to find out what was wrong. It was clearly related to, or the same issue as, the earlier starting issue, just much worse. When I opened the engine fuse box, I found the problem. Some connection on the relay for the Electronic Fuel Injection had shorted out. Instead of just breaking the fuse, it had melted about a third of the entire fuse box away. We poked and prodded for half an hour, and finally managed to get the engine started using a headlight fuse and some tinfoil. Then we limped a fewkilometers to the next gas station to try to find help. It starts! A little rough, maybe, but it works. He had completely removed the fuse terminals and rewired new ones. I thanked him and nervously asked him for the bill. He pulled out a sheet of paper and wrote down, “30,000”. I was… Amazed! 30,000 Colombian Pesos is about equal to $15. We paid him, thanking him profusely, and were on our way, a few hours behind schedule but with a working car. That night we had wanted to make it to Pasto, Colombia, where we had heard there were good camping spots. But, being behind schedule due to the breakdown, and numerous delays due to road construction, we were still hours away and the sun had long since set. 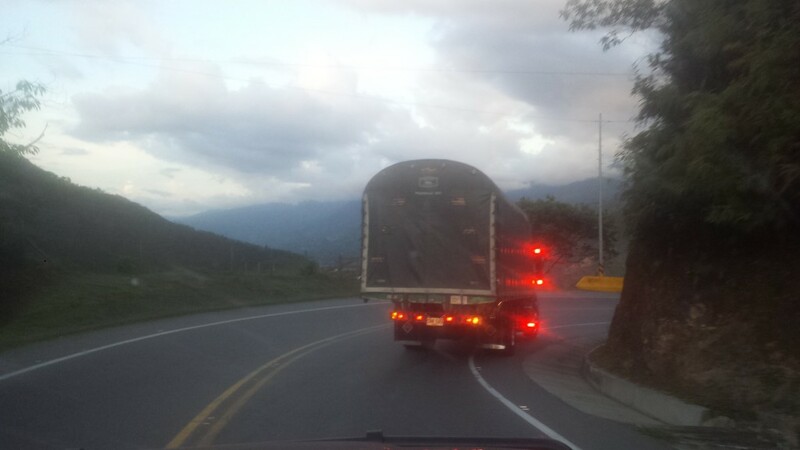 We camped on the side of the road outside of Popayan, and slept restlessly as trucks drove by in the night. The next morning, we got up early and drove to the Colombia-Ecuador border at Ipiales, Colombia. 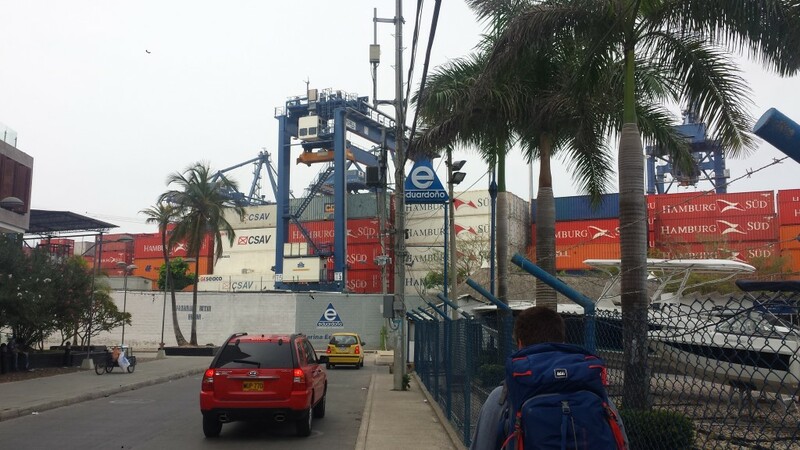 Compared to borders in Central American, the Colombia-Ecuador border was downright boring. We crossed before lunchtime, and continued on into a new country. After breakdowns, road camping, and construction delays, we were very relieved to drive on the somewhat mountainous but generally pretty nice roads in Ecuador. At some point during the day, the cigarette lighter that we used to charge all of our devices stopped working, which complicated things somewhat. We used the electricity to power our tablet, which had all the maps, our always on dash cam, and our phones, and more importantly, for listening to A Game of Thrones on audio book. Not being able to charge these devices presented a dilemma, especially for the GPS maps. So in Ecuador, just before Quito, we stopped at a shopping mall for WiFi and electricity. We drove through Quito right as the sun was setting, and tried to find a place to camp. On our map, we could see a Parque Nacional (National Park) just past the Ecuadorian capital and decided to go for it. We pulled off the highway and trundled up roughly 15 km’s of single lane, muddy track until we reached the entrance to the park. We found a large lodge and gravel parking lot, completely deserted, with a chain across the entrance. Oh well. We found a flat spot and made camp for the night, and never encountered another soul the rest of the evening.